Kitty has the chance to start over, to reinvent herself, when her mother accepts a job in Amsterdam. She doesn't want to be the frail girl any longer, the person who needs to be looked after. Her new identity works and she makes friends pretty easily. Ethan is the son of a very dear friend of Kitty's mother. He's unpredictable and shows Kitty how it is to be fearless. He's a big flirt and doesn't take things too seriously. Theo is badly damaged by an affair that went wrong. He's still pining for the one he loves who is currently out of reach. He's in Amsterdam because his family sent him away. When he meets Kitty he finds someone he likes, someone he can talk to. She seems confident and experienced. Kitty has two great guys in her life now and she is falling in love, but is that really a wise thing to do? This is Not a Love Story is an interesting story about living, love and life. Amsterdam is a fantastic setting and Keren David describes it really well. I loved seeing all the familiar places through her eyes. The main characters are fascinating. Kitty is an insecure girl who's trying to be more confident and more daring. She's still herself, but she tries to be a more outgoing version. She's strong and she's a bit naïve. She has health problems and she doesn't want any of her new friends to know about them. She wants people to see who she is without the label of being an ill person which is understandable and it makes a good story. Theo is in Amsterdam against his will. He's staying with a relative, because his parents sent him away. He worries about his mother, who's gravely ill, but he isn't allowed to be there for her. He's hurting and he's sad and he doesn't expect life in Amsterdam to bring him completely new experiences and a new version of himself. Ethan is a bit of a bad boy, but a very sensitive one. He isn't easy to read and always has a plan, to do something, to liven things up. He's talented, but doesn't know what to do with his future. They form an unusual group of friends and they're perfect main characters for this amazing story. 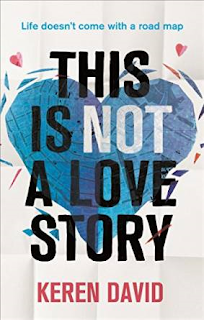 This is Not a Love Story is a story about finding yourself, about discovering who you are. Ethan is completely himself. He's bisexual and he flirts with everyone around him, but he doesn't let anyone come close. Kitty is intrigued by him, which adds to his image. He's also a little bit dangerous to be around. This story works so well because of the main characters. They're all from families with difficulties, they all have something to hide and they're trying to find their way in Amsterdam. Ethan is half Dutch and Kitty and Theo are English. For Kitty and Theo everything is new and it was wonderful to see them grow up really quickly. They discover a lot about themselves in a short period of time. That results in a surprising ending which I liked very much. I highly recommend this original book, it's really great.